In the US News and World Report’s 2010 Guide to America’s Best Colleges, Radford University is listed as one of the nation’s 'Top Up-and-Coming Schools'. In addition, the Princeton Review has included the University on its list of best colleges and universities in the South East four years running. 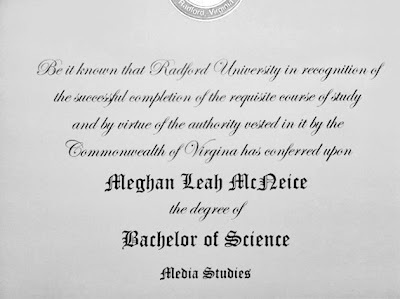 So Meghan McNeice, a recent Media Studies RU graduate, was disappointed to see that the word Virginia was spelt incorrectly on her degree certificate. But it wasn't just hers. 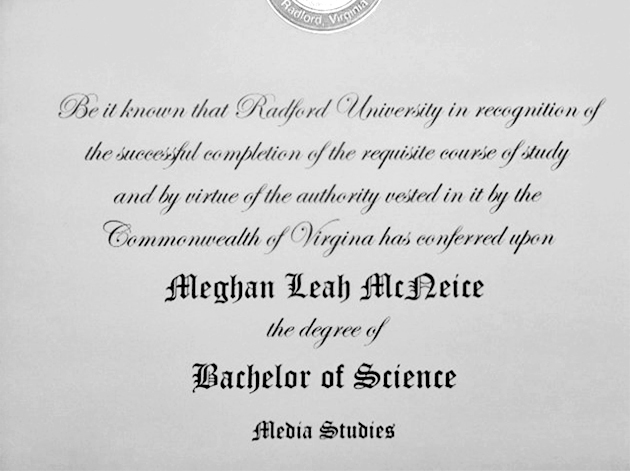 According to RU officials, all 1,481 undergraduate and graduate diplomas from late 2012 and early 2013 carried the same error. And that wasn't the only one. How very PR of you, Joe. But the re-keying isn't the issue. The fact that no one read a proof is the important point here. In a University which runs courses in Communication and Journalism.